If there is one thing you shouldn’t forget about content marketing, it is implementing a solid and creative strategy to promote your content assets to your target audience. Building communities (sub-groups of your target audience) that are exposed to your brand, which can help your future content get social shares in its first days after launch. Increasing the probability that bloggers in your space would link to your content (especially if your content is worth sharing to their readers). Engaging with popular media outlets in your local and niche vertical who would be interested to cover news or stories about your brand, which would be made easy if they’re attracted to new information or ideas from your content. Generating leads/sales through referral links from popular blogs/sites and connections built with influencers during the process of promoting your content. If you already decided to invest your time and effort in showing your content to your target audience (especially those who still don’t know your asset), then you can follow at least ten of the content promotion strategies I listed below. Content promotion through outreach is done in a one to one person basis (unless you’re doing an email blast for your campaign). If you send 100 emails and you get a 10% click through rate, it means that you have an additional 10 visitors on your site (assuming we exclude those people who were referred by your recipients to visit your site as well). The chances of getting more visitors who will likely to share your content depend on the number of recipients and emails you send to them. The larger your list of recipients, the more new visitors you should expect to see in your Google Analytics account. You can make this 1-to-1 email outreach work more effective by adding a few texts to your email template. You can actually increase the chances of getting a few more visitors from a single email using this simple approach. Step 2: Add these simple lines to your email template (beginning and end of your email). I noticed that your team tweeted a [topic] post on [Site Name]. Happy to hear a feedback from your team. Step 3: Add this subject line to your email. Step 3: Click the send button (or schedule your email if you are used to it). Because you allow your email to be read by a team, you have chances of getting more shares from each person in that group (once they passed it on to one another). Additional visitors to your website and followers would be possible if your content captures their interests. Interviews are open doors to show off your expertise and improve your site discovery by allowing people to visit your best pages/content (which will help them decide if they want to follow your brand in a regular basis). How to open interview opportunities? Step 1: Create an interview page. You don’t need a highly skilled graphic designer to create a well-designed interview page for your website. Interview requirements including audience type and the topic of the interview (number of email list is optional). Step 2: Make this page visible to your visitors. Add a menu linking to your interview page. Design a simple advertisement and make it sticky in the sidebar of your website (you can use Q2W3Fixed Plugin). 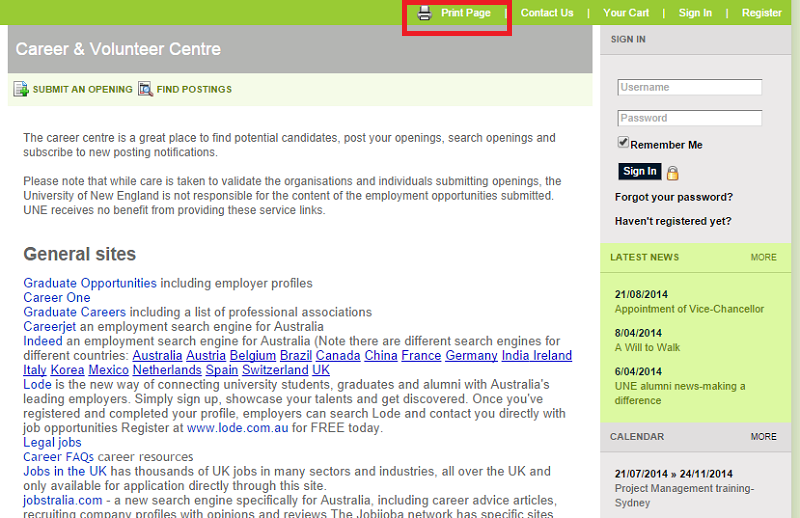 Step 3: Promote your interview page. Share your page in your social profiles. 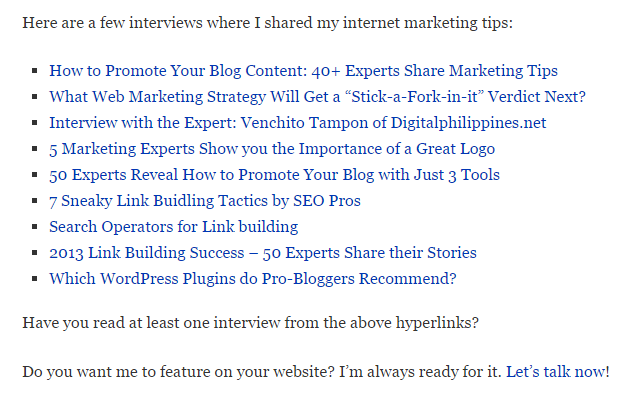 You can also link to your interview page from your newsletter, once in a while to boost its visibility. As you consistently produce more high quality content on your blog, your chances of getting interview opportunities are higher. Build second-tier links to pages that are already linking to your site through referencing them from your interviews (add a descriptive call to action when linking to those pages to entice clicks and shares). 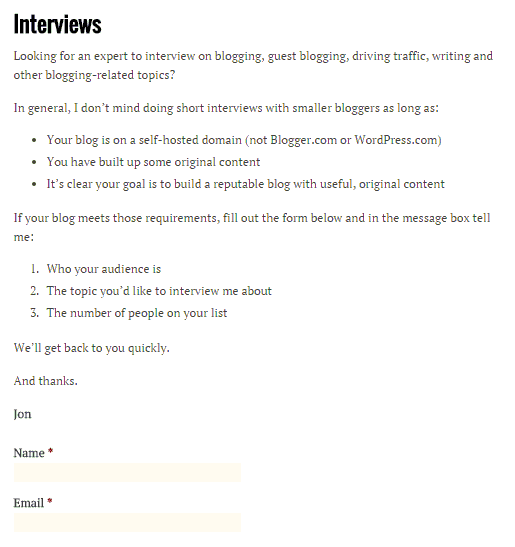 Use your interviews to capture subscribers from blogs where interviews are hosted. Promote your contributions through linking to them from your about us page (this will add some trust and build stronger relationships with the interviewers, allowing you to get some more interviews). Guest blogging has a lot of benefits even after you got a link and shares from the content distributed site. You can promote your content to people who’ve shared your recent guest post and get them share your newest content as well. Given that they already know your brand through the caliber of your content, it’s easy to entice them to share your content (assuming you exceeded their expectations as readers). 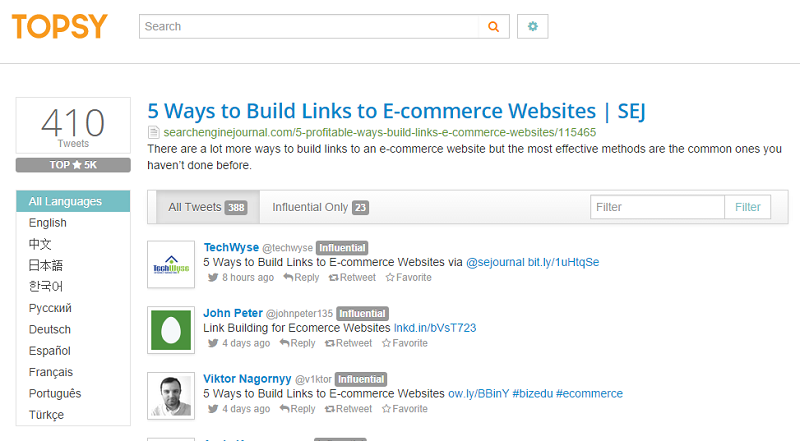 Step 1: Identify social shares of your recent guest post using Topsy. Grab the URL of your guest post and paste it on the search box. Then click the search button. Step 2: Check if those social sharers have their own websites or blogs. If they have, include them in your Twitter spreadsheet. Step 3: Find their email addresses using any of the following tools. Step 4: Send them outreach emails using the template below. 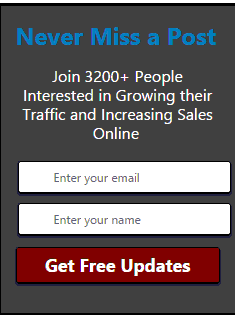 I noticed that you shared [topic post] on [Shared which post]. I appreciate your social sharing a lot. Just wondering if you’d like to see my latest 4000-word ultimate guide about [topic]. Please let me know if you want to check it out. You thank the person who shared your post. You make your description strategic and short (e. 4000-word ultimate guide). Your brand needs a community whether you’re a one man team or handling hundreds of team members. Building a solid community these days is easy with social media marketing. If you’re actively sharing posts on Twitter or at least engaging your followers through retweet and favorite activities, then you should start creating Twitter lists to leverage your engagement and increase social following even more. You won’t just create a list and leave things behind. You should think of an exclusive content that you’ll provide to them to strengthen connections and attract more social followers through their behaviors of sharing your content to their followers. Step 1: Find all social followers who mentioned you in their tweets. Most of the time, these are your followers who also shared your content before. You can use SnapBird to find them. Step 2: Create a twitter list. Include all followers whom you think you can share your content to. Step 3: Ask or find their email addresses. You have two options: send them personal messages and ask if they can give you their email addresses or manually search their contacts using email finder tools mentioned earlier. I’m [Name], [Position] at [Company Name]. I saw that you tweeted my post on [Blog Name]. I appreciate it a lot. I just want to ask if you’d been interested to check out an ultimate guide for [topic]. This is something that I’ve been working on for the past 3 months and would only want to share exclusively to my active followers. Please let me know if you’re interested. If you’ve been doing outreach for content promotion for quite a long time now, you know that one of the important factors that affects email open rates is the timing of outreach. If you schedule your initial outreach email at the best time your recipients would likely to open it, make sure that you also do the same thing with your reply emails. The reason why conversations were stopped is that the second to third reply emails were received by prospects during non-peak hours. If you can schedule your reply email at the time your prospect replies to you in your initial outreach, you’ll get much success from it. To schedule your follow up emails, you can use Right Inbox. Step 1: Open your Gmail account, then click the Compose button. Step 2: Write your message and subject line then add your recipient’s email address. Step 3: Schedule your email at the time your prospect replies to your initial outreach. Step 4: Send your email. The old school way of letting your link prospect know about which anchor text you prefer to be used (in linking to your content) is to directly tell him the anchor text (e.g. Would you please link to me using this anchor text: payday loans). That link building practice won’t get much success today as it will make your email look like spam. One way to actually make this linking practice still work is to add some phrases to your email to describe the content that you want to promote. Step 1: Edit your email template. Instead of only using these texts– if you want to check out my post, you can click on this link, you can actually add some descriptive phrase to your email. If you want to check out my broken link building guide, you can check out this link: (link here). Step 2: Add your subject line and your recipient’s email address. Step 3: Click the send button. Hashtags add more social visibility to your tweet, making it easy for your tweets to be seen by active social participants other than your followers. If you will add popular and relevant hashtags to your tweets, you will have chances of increasing your tweets’ social discovery. Step 1: Go to Hashtags.org. 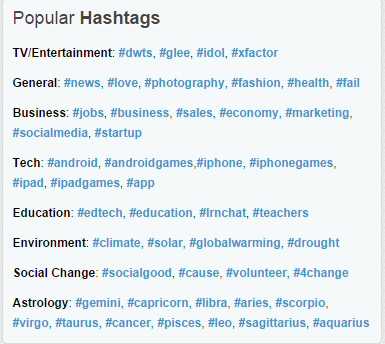 Scroll down the page and look at the popular hashtags section. Step 2: Use relevant hashtags to your tweets. If you are in the business niche, you can regularly use the hashtag “sales”. Step 3: Do it religiously. Relevancy and utility of the content suggested adding to the page. Real purpose of the page listing all the links and resources in it. Another success factor to consider is the number of external links in a resource page. If there are too many listed links, the probability of earning the link is low and the value you’ll get from it (if in case, you earn that link) will be diminished by the dissemination of page authority to several external linking pages (the higher the number of external links, the lower link juice you’ll get). The main point is to find a relevant resource page that have a fair amount of external links. Step 1: Plug in the URL of the resource page to Ahrefs. 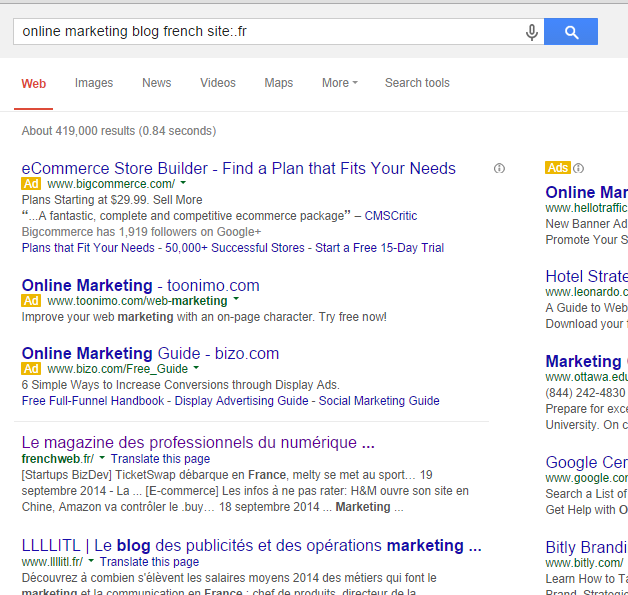 Step 2: Go to Outgoing links tab – Linked Domains. Step 3: Look at the number of results. If it is more than 100, then find another resource page to prospect on. The reason why you need to consider the number of external links is to increase the probability that you’ll going to get the link once you start reaching out to the target linker. The higher the number of external links in a resource page, the lower the chances of earning your desired backlink. When people are not satisfied with your newsletter content (email), they usually want to find the unsubscribe link to get rid immediately of all your future promotional emails. This will obviously decrease the number of your subscribers in your email list. But you can avoid people to unsubscribe to your blog but at the same time allowing them to do it if they decided to do so. Step 1: Go to your email marketing tool settings (for this example, I use Mailchimp). Step 2: Go to settings (for Mailchimp: Campaigns – Design). Then select a template. Step 3: Edit the footer section by changing the unsubscribe text to manage subscription. Step 4: Click Save &amp; Close button. If you limit your link building strategy to relevant niche and local blogs, you will be boxed with link opportunities surrounding your space only. But if you go a step further and look for non-English blogs that can translate your content to other languages, you’ll find much success with it in terms of building high quality backlinks. 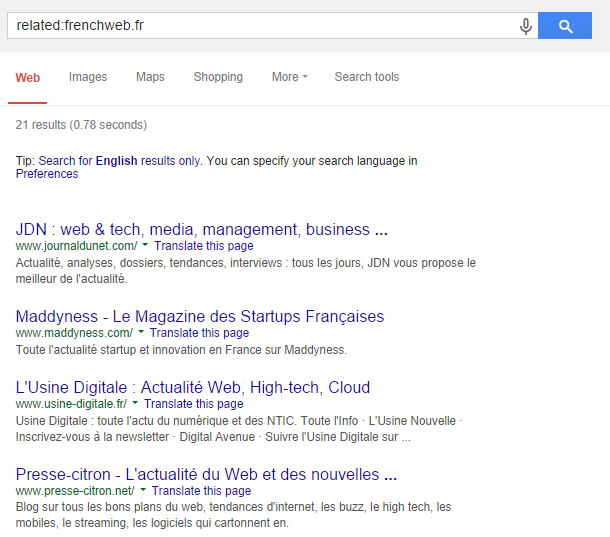 Step 1: Use your descriptive keywords as your search queries and add the site search operator to it (e.g. 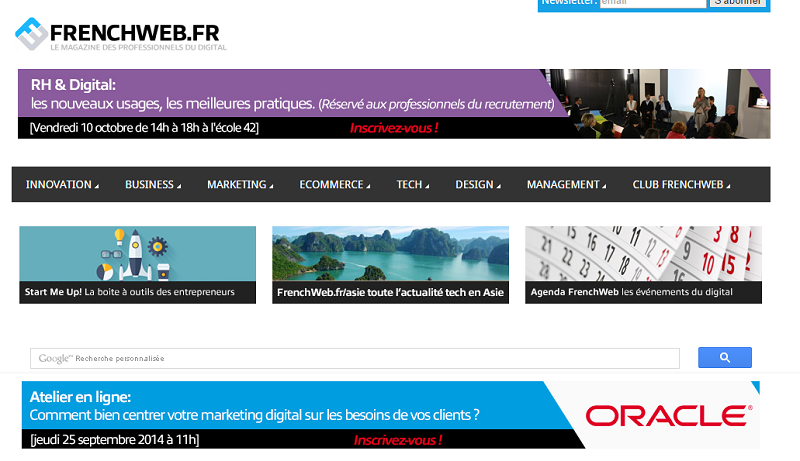 online marketing blog site:.fr). Step 2: Populate your list by prospecting more related non-English blogs. Use the related search operator as your search query. I’m [Name], [Position] at [Company Name]. Heads-up to your recent post about [topic]. Thanks for sharing it. By the way, I’d like to share my recent link building guide on [topic]. I’m wondering if you’d be interested to translate it to [language]. Please let me know your feedback. If you’re working on several link development campaigns that are all in the same industry, you can maximize every post/page you’re getting links for each of those campaign. However, you have to be careful with it because you don’t want Google to see some kind of footprint in your campaigns. Make sure you include your client’s domain to your other client’s target page when they are only relevant to each other. Step 1: Find a topic that will allow you to include two separate domains of your clients in a single blog post (assuming in this example it is a guest contributed article). There’s no tool that you can use here. Use your brain. Be creative and target a non-very specific topic as much as possible. Step 2: Write the post. Use list post as your content format to make it easier for two domains to be included in that single post (just make sure both domains have the same offerings – e.g. both have WordPress plugins). Use one domain as your example (in case you want a case study type of post) and just link to the content page or category page of your other client’s domain. Use one domain’s image (link to the homepage URL/post URL if possible, not to the attachment URL) as your featured or secondary image, then just contextually link to your other client’s domain from the same blog post. If there’s no chance to include both domains, don’t try to do it (always remember that one post must have one message/information to discuss about). Step 3: Publish and promote the post. If you’re handling multiple clients (4 or more) all in the same industry, you can maximize all your linking opportunities by following this content promotion strategy. Even if it is an image linking to a homepage URL of one of your client’s domain, it is still worth it, especially if the page/post is relevant to the domain. If you’re still not leveraging Google+ as one of your content promotion platforms for your brand, then you’re missing a lot of marketing opportunities. Increasing your Google+ engaged followers. Build connections with Google+ influencers particularly those authors of articles you’ve mentioned in your round-ups. Amplify your content through link inclusion in the round-up, engagement (+1s, share, etc..) and sharing activities from Google+ influencers in your space. Here’s how you can effectively apply this technique to your content promotion plan. Step 1: Create a list of weekly popular content (slide decks, articles, guides, courses, etc..) in your industry. You can quickly find them on your niche community site (for online marketing niche, you can visit Inbound.org to find daily best articles). Step 2: Write your Google+ post. You can follow this simple format. Use categories to classify your list of resources and to add hashtags to your post (which can help increase the post’s visibility and popularity). Write a call-to-action at the end of the post to encourage your social followers to check out your next roundup posts. Step 3: Promote your Google+ weekly roundup. To promote your roundups, you can share them to your email subscribers, site visitors (by linking to it from your blogroll links) and on your Twitter profile. Posting weekly roundups with links pointing to your site’s internal pages is better compared to single posting of your article on Google+. Your roundups could earn more social shares and +1s than your self-promoting posting on that social platform. Choosing between a homepage link and a deep link, when pursuing links, is still a debate today. Building links to your homepage could pass authority and link juice to your sub-pages and posts. 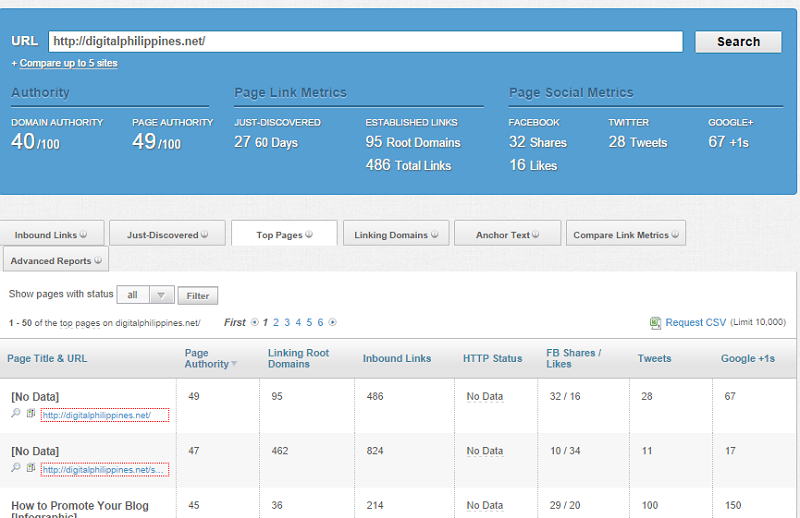 Deeps links will prove that your other pages/posts aside from your homepage are serving your visitors appropriately. Let’s move on to building homepage links to your website. Here’s how you can do it. 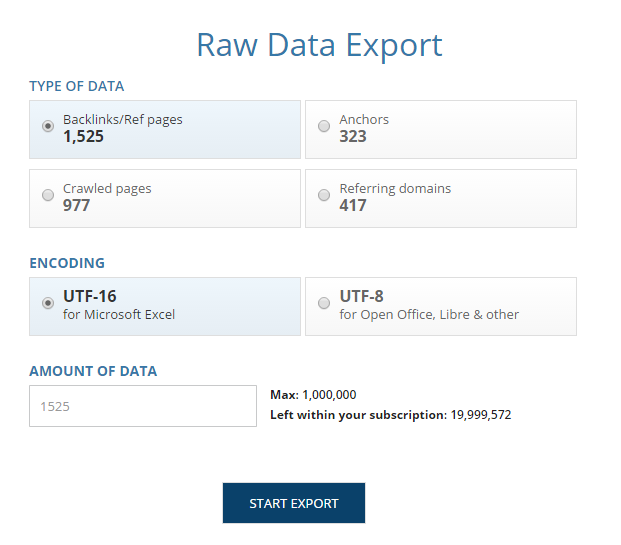 Step 1: Export all links pointing to your website (whether homepage or deep pages). You can use any of your favorite link building tools (Ahrefs, OSE or Monitor Backlinks). Step 2: Remove unnecessary columns and only remain columns for page rank (Ahrefs rank), referring page URL, referring page title, number of external links, link URL and link title). 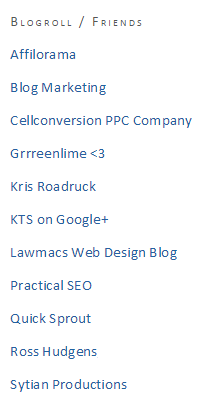 Step 3: Sort by Ahrefs Rank and Domain Rank (highest to lowest). Step 4: Check out corresponding referring page URLs of non-homepage links in the Link URL tab. (e.g. if you see a www.domain.com/blogpost in the Link URL column, and its corresponding referring page URL is www.referringdomain.com/blogpost1 , then visit the latter URL). If contextually placed within the content, check if it makes sense to replace the link with homepage URL, i.e. it will not deteriorate the overall message of that section of the content. Identify descriptions to the link (e.g. According to Moz, the large portion [link]). If it mainly describes the content to the site’s inner page, then it could be impossible for content managers to edit the text and link. Step 6: Reach out to the content manager and ask to change the deep link to homepage link. You can use this email template from Ross Hudgens. Thanks so much for covering our recent article. QUICK CUSTOM RESPONSE TO COVERAGE. Anyway, I’m reaching out today with a small request – is it possible to link to our homepage, http://WEBSITE.com where you mention BRANDNAME on the post? I think it would add additional value/context to your readers, and of course, would be much appreciated as well. Thanks so much for considering and if nothing else, consider this email a thanks! Infographic marketing is not a common content-based initiative today. Several brands had already invested into this content creation process because of the value infographic could provide to a certain brand or website (i.e. reach, branding and SEO benefits). The common outreach practice for infographic promotion is asking the webmaster if he/she is interested to publish the infographic on his blog, share it to his social followers and get the link that the brand deserved. There’s nothing wrong with that. But if you can add a few tweaks to your outreach email, you can help your infographic earn more shares and natural links from researchers and bloggers. Thank you for allowing us to publish our infographic on your blog. Could we request something? Is there a chance to put some tags on it (tag 1, tag 2, tag 3) and put it under [Site’s Category] to let your visitors find the image easily. The more your infographic becomes visible on several tags and properly categorized on the hosted blog, the probability of earning more page views is higher. Optimizing your site search can help your visitors convert to customers (see this ConversionXL post for more information). Site search optimization is not only good for conversion rate optimization but also for adding visibility to your most important pages (those that already gained popularity and authority in your space). When people search for specific terms that are visible in your search box, your authority pages (e.g. 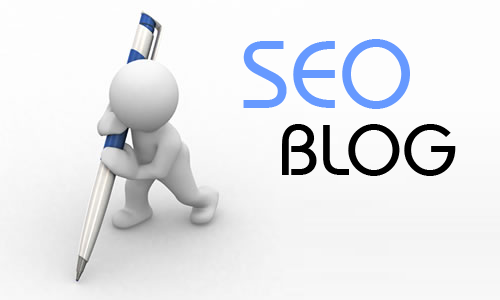 top blog post) will normally be placed in the top spots of search results and thus, can earn additional shares and links from people who’re digging information from those pages of your website. Here is a great post on ConversionXL that will walk you through customizing your site’s search box. This technique will depend on whether or not your industry has websites where you can submit your post and be upvoted by other users (when found to be of high quality and useful for them). Examples of these content-upvoting websites are Reddit and Hacker News. Getting your content to top page for those websites in the category of your choice would need connections with active memebers in order to rank easily in those sites. You can follow this step by step guide. Step 1: Search for active members in your niche’s community website. Step 2: Research on their personal blogs or websites, contact emails and social profiles (simply do a Google search for their names to find those basic details). Step 3: Reach out to them and build relationships. If you are using broken link building for your marketing campaign, then this content promotion technique is for you. Resource pages are not constant in nature. Webmasters and content managers constantly update links pages with new resources and remove any resources that have no content in them (404 pages). If you already executed an outreach campaign for resource page link opportunities before, then you may want to go back again to your list of link prospects. Step 1: Visit each of the resource page included in your list and check for new broken links (you can use Domain Hunter or Check My Links tool). Step 2: Update your list with new founded broken links. Step 3: Reach out again to resource page owners with broken links in their pages. Pro tip: Take note of newly added content to resource pages and discover pages linking to them. This will help you find more link opportunities for your website. Guest blogging is not dead. SEOs are still using it in the right way to show their industry expertise and increase popularity for their websites through links acquired from referring domains. Blogs with built in community are the best places to get links from given that you do not only get some SEO benefits but a ready to engage people that can help promote your content. Step 1: Go to Reddit and look for the reddit sections that are related to your industry (simple type in your keyword in the search box). 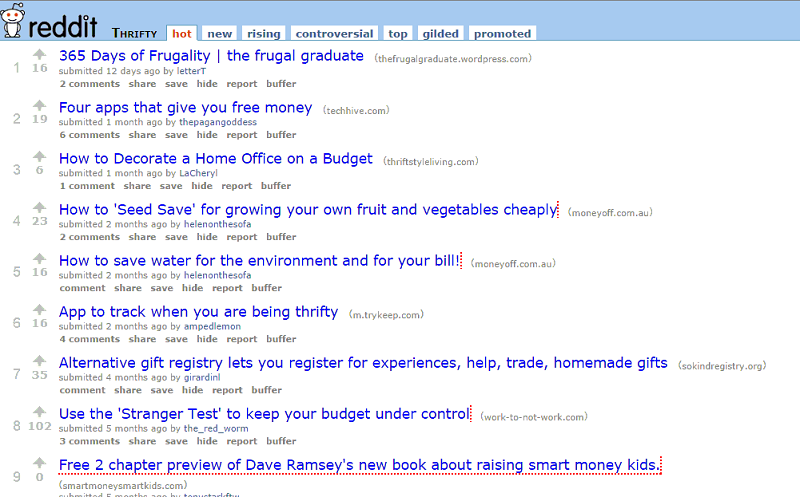 Step 2: Visit the top pages in your reddit niche section. Step 3: Identify if there’s an opportunity to contribute content to those discovered blogs. Look for guest blogging guidelines or contribution page, or simply reach out to site owners and ask if they are interested for a free content (guest post). Step 4: Contribute content to those websites. Online marketers love to add social sharing buttons to their webpages but tend to forget adding print this page button to pages or content that can be used as references for educational purposes. Entices researchers to understand and learn information from the page, referencing it for their own content works. Internal linking helps your non-ranking pages get promoted from pages that already have high page authority and have some domains already linking to them. If you’re still new in blogging, you won’t get much success with it, but as time goes by, your readers or fans will begin to read more of your pages not just the blog post that they landed on the first time. And this is where internal linking helps. It attracts people to read more of your content, which will later on translate to links and shares (when these people start to reference your works from their websites or just share it to their social followers). Step 2: List down all search queries with high impressions and CTR but have low Average position (low average position means that they’re not ranking high in search results). Step 3: Check what pages on your website are targeting those search queries or keywords. Then include them also in your spreadsheet. Step 4: Go to Open Site Explorer. Plug in your website into the tool and check the Top Pages section. 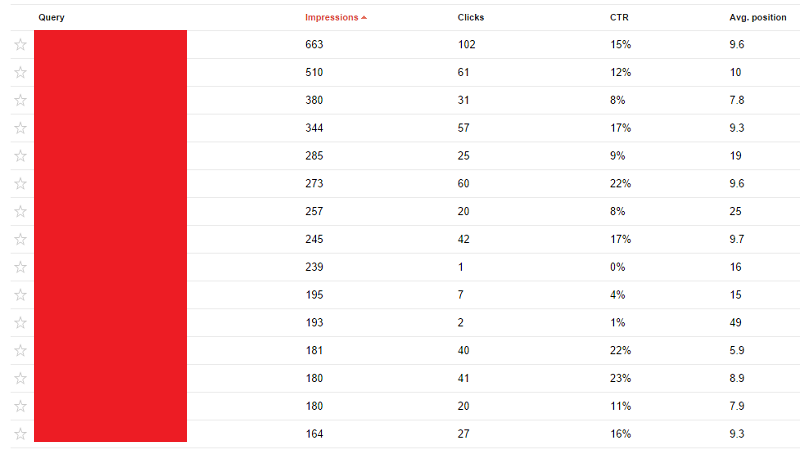 Step 5: Link to non-ranking pages (pages that have low average position) from your top pages in OSE. Ensure that linking pages are topically relevant to each other. One of the main goals of blogging is to increase page views and time spent by visitors on the site through engaging them in the conversation or comment platform (below each blog post). You can achieve that goal for your campaign if you can add a recent comment section on your website. Here is an example of a recent comment section on SEO by the Sea. Step 1: Install Recent Comments plugin on your blog. Step 2: Make your community aware that your comment section exist. Share it to your social followers. Add these simple lines to your status updates. Hey guys, you can now see recent comments on my blog [attach screenshot]. 🙂 Let’s talk in the comment section. Remember the fixed widget plugin? You will use it again in this content promotion strategy. The process is very simple. You fix two widgets in your sidebar to increase your chances of achieving any of your two main brand-related goals. For instance, if your goals are subscription growth and social following boost, then you may want to fix your email opt-in form and social profiles widgets. Step 2: Click Primary or Secondary sidebar. Step 3: Click on the widgets that you want to fix on your website. Then check the Fixed Widget check box. 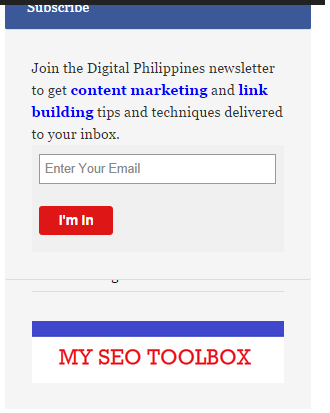 Because you have two widgets to display on your website (which is very visible even if your visitor scrolls down to the bottom of the page), you have high probability that the visitor will click any of the two options: subscribe to your newsletter or click on your image pointing to your resource page (or content). Bloggers are now revealing their email list numbers on their blogs (see examples below) to help them built trust to their target audience and capture their emails through the opt in forms. If you’re planning to do regular content contribution on popular blogs, then email list number should be one of your deciding factor when identifying if a blog is worth submitting your guest posts to. Visuals or images help users to depict in their minds the information they consumed from your content. It also helps them understand easily the message being presented in the article or page. You can actually use images (particularly branded images) to get more exposure for your content (image content promotion). Take a look at this simple image below. Did you know that it has been used 700+ times on the web? Images can give you links that are properly attributed to your domain. With that benefit, it can help you increase your domain authority as well as the authority of the page being linked to (where the image is included). Step 1: Find a non-licensed image to edit as your featured post image. Do a Google search for a term/phrase and click Images. Click on Search Tools – Usage Rights – Labeled for reuse with Modification. Step 2: Save the image of your choice and edit it using image editing tools like Pixlr and Canva. 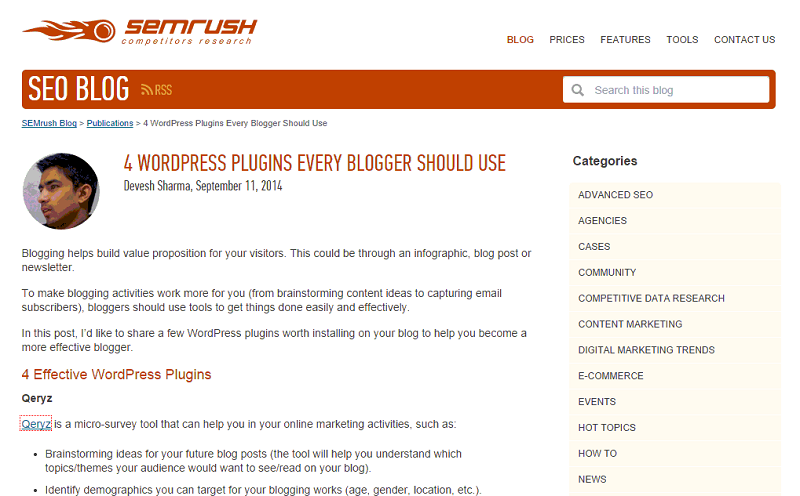 Step 3: Include the image to your article, whether it is for your blog or guest blogging. Step 4: Track non-attributed images using Tineye. Simply upload your image to see image results. 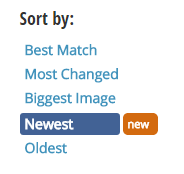 Step 5: Sort by newest links. I’m [Your Name], the [Positon] of [Company Name]. I’d like to thank you for your including our image in your latest article about [topic]. Much appreciated. Is there any chance you can mention our brand as the source of the image and link to our website? Please let me know if that is possible. Thank you again. Hoping to hear feedback from you. Brian Dean shared a very simple guest blogging process on Backlinko that will get you results for your SEO campaign. 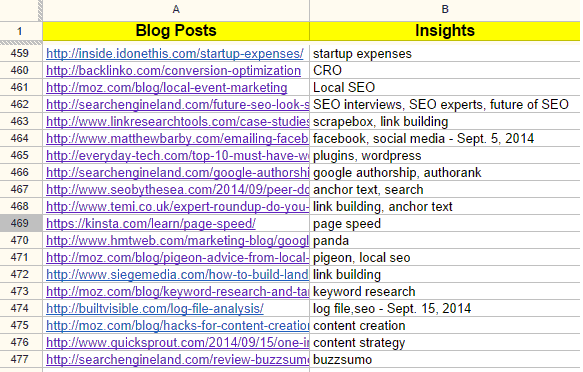 It’s all about using expanded list posts for guest blogging. Just like a simple list, you curate things, tools, resources or tips that are useful for your readers. But in every item on the list, you include detailed sections or put a step by step guide on how to actually do it. This makes it easy for people to extract information or understand clearly each item on your list. 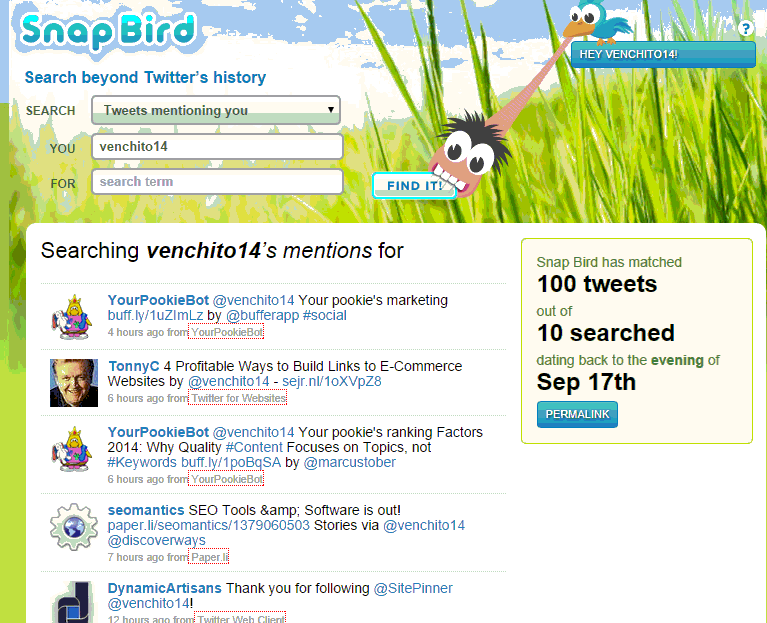 This image below is a screenshot of my old guest post on Search Engine Journal. It is a good example of an expanded list post. 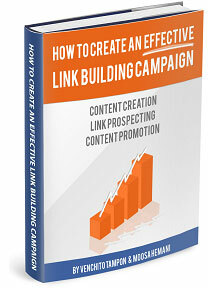 It currently ranks for the phrase link building tips and white hat link building. Creating content is only half the battle. You’ve got to figure out how you can win in the competition by executing any of the above content promotion strategies. If you have a content promotion strategy in mind, let me know in the comment section below this post. If you liked this post, you can subscribe to this blog or follow me on Twitter and Google+. Subscribe and get this awesome ebook today! Are You Ready for Marketing Automation?